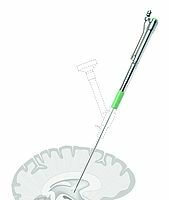 The new LEVICS Micro instrument is designed for precise ultrasonic aspiration of intracranial and spinal tumors. It stands out due to its high user-friendliness, which is reflected in a low instrument weight and easy assembly. Come and visit Söring at EUROSPINE 2018 from September 19th - 21st in Barcelona and learn more about the use of our ultrasonic-assisted bone instrument at booth 35A. On November 22 and 23 the "5th International Workshop Ultrasonic based Spine Surgery" will take place at the University Hospital Greifswald. This workshop is organized by Dr. Jan-Uwe Müller, Deputy Director of the Department of Neurosurgery. Participants are expected to receive 17 credit points. On August 1st, Söring will start the three-year research project "UltraLas", which aims to improve tumour detection and thus enable an even more precise and low-risk resection of neurosurgical lesions. 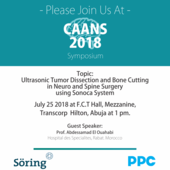 Söring GmbH invites to the symposium "Ultrasonic tumor dissection and bone cutting in neuro- and spine surgery using SONOCA system" which will take place on July 25 at 1 p.m. during the CAANS congress in Abuja, Nigeria, in the F.C.T. Hall of the Transcorp Hilton Hotel. The use of the Söring bone instrument leads to significantly lower heat development on the bone than the use of a high-speed drill. This is the result of a single-blinded prospective randomized controlled study conducted at the department of neurosurgery at the University Medicine Greifswald. Söring at general meeting of Wundzentrum Hamburg e.V. Yesterday the Wundzentrum Hamburg e.V. 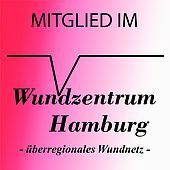 (Regional Society for Wound Care Specialists in Hamburg, Germany) held its 64th general meeting in the Lindner Parkhotel Hagenbeck, Hamburg. A perfect opportunity for Söring to exchange with wound treatment experts and stay informed about the latest developments in the regional wound care sector. Söring GmbH is now offering its Macro HF instruments with the international 3-pin connector. This makes it easy to connect them to almost any high-frequency generator available worldwide. The new open-platform concept is unique worldwide. From 22 to 24 January 2018 Söring presented its endoscopic ultrasonic aspirator for neurosurgery, which is still unique worldwide, at the Hands-on Workshop on cerebral and ventricular neuroendoscopy in Naples. Within the Focus Ultrasound, as announced earlier this year, we strongly bundled our efforts on what we do since 1985 – innovative products in Ultrasonic surgery, meaning for clinical applications as neurosurgery, spine surgery, liver surgery and wound debridement.